4 years ago Monica Sawhney, a ballsy entréprenuer (and talented cook) from North Manchester, spotted an opportunity to dip her toes into the restaurant business without taking on the usual restaurant overheads. This is where she started ‘The Spice Club‘, Manchester’s first ‘in home’ supper club. 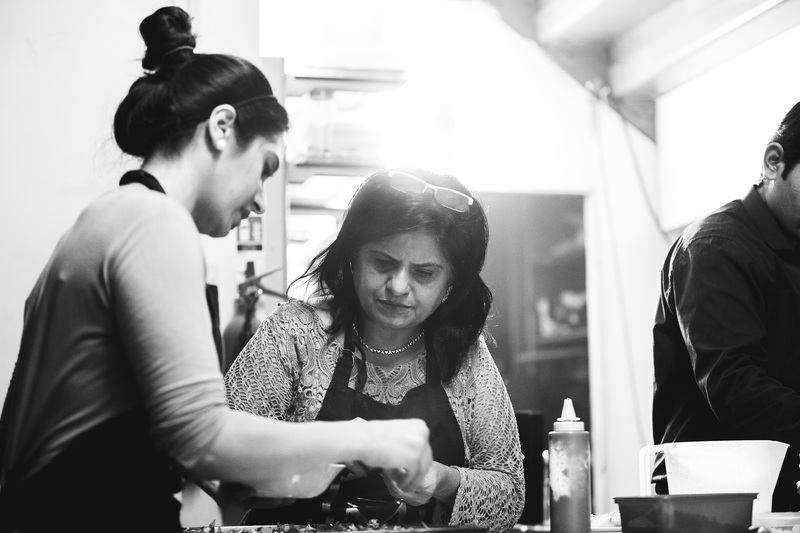 After starting as a small, experimental club serving Indian food from the family home, Monica has steadily nurtured ‘The Spice Club’ into a well-recognised brand in the Manchester food scene. 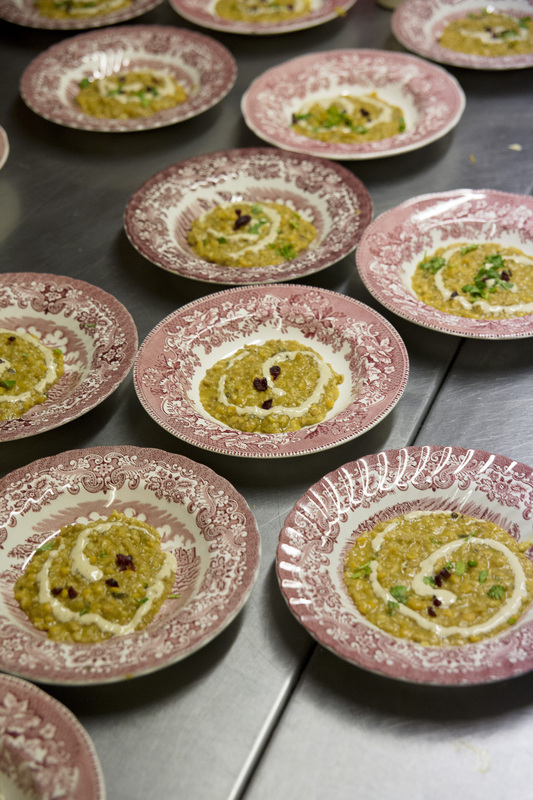 They now offer cookery courses as well as putting on large-scale events, and her pop-up restaurants have appeared in secret locations all over Manchester – places at the Spice club are in demand with events often selling out immediately as tickets are released. The reason for The Spice Clubs popularity is that Monica’s food is sublime. It is nostalgic and authentic, and at the same time experimental and exciting. It takes diners on a tour of little-known India, and allows guests to taste dishes they would only discover if travelling to India with a friend who had local knowledge. The menu varies massively at each event, and features street-food, a vast vegetarian repertoire, and rich and luxurious regal curries. Service at ‘The Spice Club’ is slick and guests can eat as much as they want, with empty dishes being replenished stealthily and seamlessly. Guests are encouraged to feel part of the family and after eating the Sawhney’s food they leave actually wishing they were. I met up with Monica behind the scenes at ‘The Spice Club’s’ 4th birthday meal, at RedbankCo, to see first-hand how this well-oiled machine works. Is The Spice Club a full-time job for you? No, I’ve never seen ‘The Spice Club’ as a business, per se. I describe it more as a labour of love. I work in fashion full-time – my current full-time job is the online women’s fashion website that I run with my brother. I did actually go to university to study Hospitality Management, though (with a focus on restaurant management – food and beverage management in particular). Whilst doing my degree I got the opportunity to work in, and manage, some restaurants and I started a recipe blog while I was there; that’s when I really got into food. I went to university in the States, and when I came back I was itching to get into the restaurant industry. I was 21 and fresh out of uni, but had no cash and realised that wouldn’t be possible. That was when I decided to start the supper club. I’d heard about underground restaurants and supper clubs in New York, Miami and London, but there was nothing that similar in Manchester at that time that I knew of. I thought, I’d love to showcase the food I’m making at home and see how it’s received. So I started The Spice Club. That was all before we launched our online fashion business. Now running our fashion business has become my full time job – it’s Monday to Friday fashion, and then the weekend is spent doing food and events. I feel very lucky that I can two different things that I do actually enjoy! How long has the Spice Club run for? Our first event was held on September 2010, and now we’re in our fourth year. I didn’t know what to expect when I started The Spice Club; there was nothing close by to compare it to. I just wanted to try and see what happened. I’d never actually been to a supper club myself so I was just winging it a bit. The first time I approached my mum I was a bit reluctant, saying, ‘Do you mind if we have some people over to our house for dinner?’ My mum’s reaction was naturally, ‘No..are you crazy?’ Although, with a bit of gentle persuasion and explaining, she eventually came round to the idea. My mum was the one who originally taught me how to cook and she knew how passionate I was about getting into the industry. She said we could try one and see how it went. So we had 8 people, half of whom were friends, and half who booked online. In the lead up to the event I was so nervous. I thought, ‘What am I doing? This is crazy. This is so silly. How did I come up with this idea?’ But the first one actually went really well and so we decided to do one soon after. It’s since grown over the years. 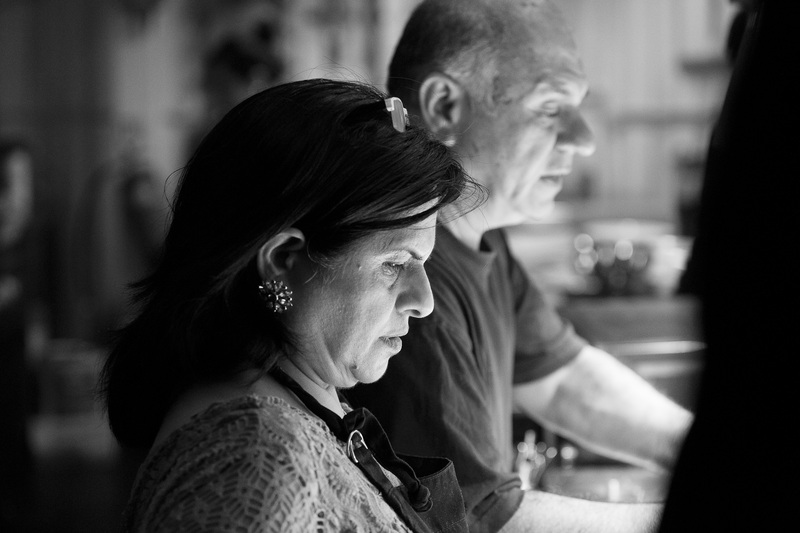 I run and manage ‘The Spice Club’, with my mum helping out, and occasionally my dad and my brother will help too. It’s most definitely a family affair! Have many people do you cater for at your events? Our biggest event was for 65 covers, at Kosmonaut in the Northern Quarter. I’m gobsmacked at how much The Spice Club has grown, and the positive feedback has been great. For us, it has always been about serving home-cooked Indian food that you can’t get..well..outside the home! I was really looking forward to doing 65 covers, but it took time to be able to host an event with such a great number of diners. We reached that number gradually: we started with 8, then 12, then 16, 22, 32. 32 is what we do at home and because it’s been incremental it has not been overly difficult to adapt. 32 covers to 60 covers was a big jump, but I wasn’t scared. We find there’s quite a lot of demand for places and they sell out really quickly, so I thought we should just go for it. I had a few friends helping out and my brother took control of the front of house. I’m pleased to say it worked out well! I do have a routine of doing things during our supper clubs and that’s only because I want things done in a certain way to ensure the event goes smoothly. My family and any helpers we may “recruit” are always aware of what the routine is at each supper club! How does the supper club translate when in bigger venues? Everything’s still homemade, but we’re just taking it to a commercial kitchen. Because we are feeding paying guests, we need to make sure everything’s coming out at the right time and that it’s hot; we don’t want anyone to leave unsatisfied. Despite using a commercial kitchen for the larger events, it’s still all about cooking ‘fresh on the day’ for us. We do a lot of prep at home. Regardless of what kitchen we’re in, we cook in the same way that we would cook for our family. It actually works better because they’ve got the big scale equipment. When you see the big, six foot ovens it can be a bit intimidating. My initial thought was, ‘How do these work! ?’ But I have had experience before in my previous internships and so the transition was been fine. In the States the course and internships involved a mix of management and cooking – my degree was part business-based and part management. We had massive commercial kitchens and were taught how to cook basic, but restaurant standard, dishes. What other events to do you do in addition to the Supper Clubs? We do cookery classes and we also took part in the Friday Food Fight. 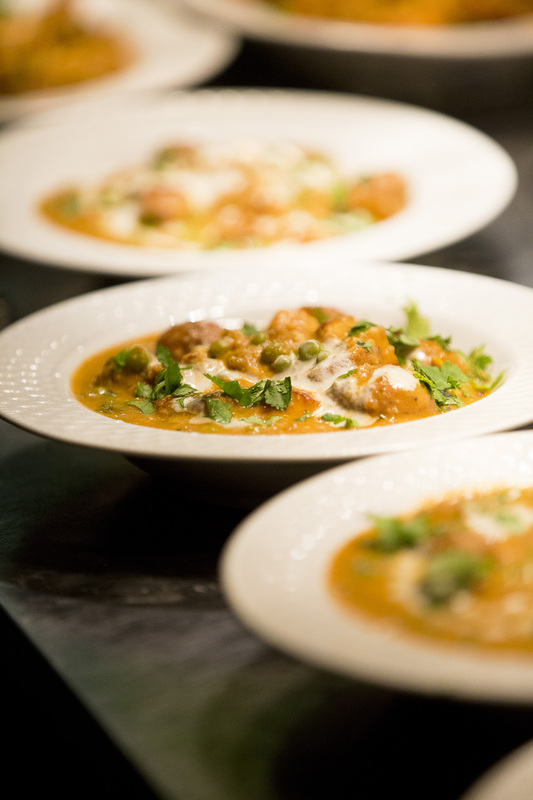 Also, last year we did a pop-up Indian street food event with a company called Raj Tent Club. They provided us with this gorgeous Indian royal Rajasthani tent and we popped up around lunch time in Spinningfields. We did street food in this little make-shift kitchen. It wasn’t pre-ticketed, and food was made fresh, in front of the customers. We’re always looking for quirky little ideas. A couple of years ago we did a pop-up in a disused restaurant in Spinningfields too. A director at Spinningfields had been to our Supper Club at home and had really enjoyed the food. He came to us and suggested using this empty unit. We did that for a couple of weeks. It is really interesting, the kinds of people you can have at the Supper Clubs; you can have a CEO sat next to a photographer, sat opposite a student. You never know what opportunities will come from it. We were also recently honoured to be invited as guest chefs at the Freemasons at Wiswell – a top ranked gastro pub – as part of their annual “Game Week” festivities. The setting offered the opportunity to finesse our Indian home-cooking style with European cooking techniques – a welcome challenge and departure from our usual way of doing things. 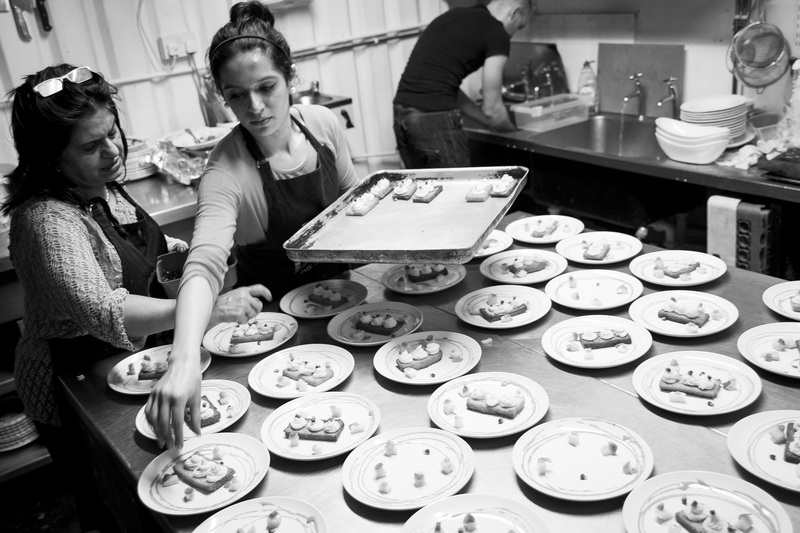 Words can’t describe how thrilled we were with executing our menu in the Freemason’s kitchen. I’ve been told you ask a little bit about each diner before the Supper clubs? A large part of supper clubs is that it’s ‘social dining’. You don’t get that in a restaurant – that communal sense of marrying food and socialising together. For me I think it’s always interesting, as cheesy as it sounds, that people could arrive strangers but they could leave as friends. The way I organise the seating plan is very sketchy, but if I can see that a few people might have similar interests then I’ll seat them together. Other times it is just random though. Initially I started asking people a little about themselves because I was inviting strangers into my home so just wanted to know a little about them and to know the kinds of people the Supper Club was attracting – I wasn’t interviewing them, no, but it was nice to have a bit of knowledge in advance. How is it, having people you don’t know in your home? It’s a really unique and lovely experience. We’ve never had anything crazy happen or any weird guests. To this date it’s gone pretty smoothly. We had a funny incident once; we always send out the address 24 hrs before the dinner and I remember I sent a text on Friday morning because the event was on the Saturday. That evening I got into my pyjamas quite early on the Friday night and I was just in the kitchen prepping food for the following day, when at 7.30pm the doorbell rang. I opened the door, in my PJs, hair scrunched up, not a care in the world, apron on. And there in front of me were a pair of supper club guests: ‘We’re here for the Spice Club!’ I immediately answered, ‘Can you come back tomorrow? !’ Because it’s in my home there’s always the risk that something like that might happen! I was so glad that they did come back the next day! Where do you get ingredients from for the supper clubs? I try to go local, so I shop at my local green grocers in Cheetham Hill, especially for herbs – coriander and mint. We’ve actually started growing some of our own veg too. We have our own vegetable patch and it’s going really well. I have a dream to do a supper club using only the veg from our own patch. Fresh is best. Local is best. I’ve been in touch with the Manc Veg people to try and get some veg that’s locally sourced, so we’ll see how that goes. With the spices, there are some specific ones I get from India. My Grandma makes Amchoor for me; it’s a mango powder that adds tartness to dishes. She has a mango tree and she sun-dries the mangos for us and then grinds them down into a powder. Whenever we go over there we always come back with a few batches. If you buy it from the bazaar or in packets it’s just not the same. The same goes for pickles, and mangos from India. We make a lot of our own spice blends at home too from fresh spices – we don’t like using the pre-mixed stuff. We make our own Garam Masala spice blend that is made for every supper club – it adds a completely different level of flavour. The ingredients are such an important factor in how food tastes, so the freshest ingredients make a massive difference. How do you decide on dishes? We usually try to theme the night. 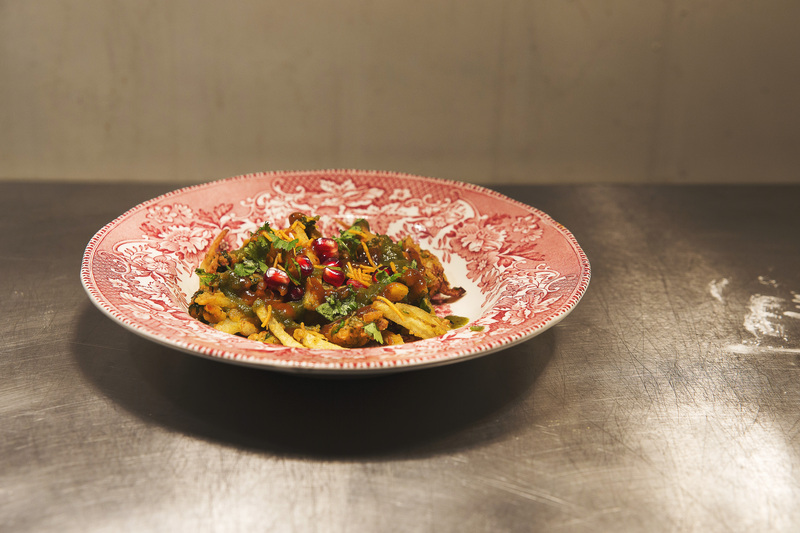 For example, we’ve done a North Indian night – my family are from North India and we traditionally cook Punjabi food. We’ve also done a South Indian night with Dosas and Idli and different types of Dals. Each part of India has different dishes that their cuisine is well known for. 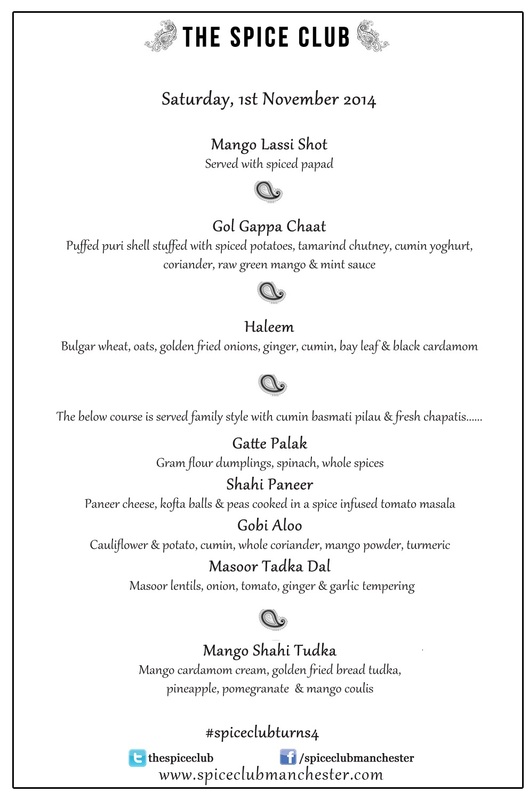 We did a Mughlai night too, with food related to the area where the Indian Royals are from. The Mughlai dishes were very rich, sumptuous and creamy. We look at a region and investigate what the prominent flavours are from there and then we’ll either do typical dishes or we might create something new. We’ll get our pens and paper out, and the pots, and we’ll just get creating. When we do Punjabi nights we use our family recipes, so recipes that have been passed down from my great grandmas, to my grandma, to my mum, to me. We’ve also done a lot of nights that have been specifically vegetarian. I do eat meat, but my mum doesn’t; within Indian vegetarian food, there are such a vast number of options because so many Indians are vegetarian. We’ve recently done a five course vegetarian feast and the diners were actually a real mix of vegetarians and meat eaters. That particular event went down a treat, and it sold out really quickly, which I found really interesting. We asked the meat-eaters whether they’d missed the meat from the dishes, and they said that they didn’t at all. We understand that vegetarians can really struggle when they go out for a meal so it was great to provide lots of options for them. Plans to open a restaurant? It absolutely was the plan when I first started, but I think that is one of the things that’s changed for me. Actually I think doing what I do has taught me a lot about what I want to do in the future, and I’m really enjoying the whole concept of Pop-Up events and social dining. I think if I was to open a restaurant it would take so much of that concept away. I think part of The Spice Club’s unique appeal is that we combine all of those things together, and I don’t want to lose that. I love that we’re getting to meet people all the time and I really enjoy the events side of it. I really put my heart and soul into a massive event. If it was everyday I can’t help thinking it would become run of the mill. I don’t ever want it to turn into that. I get asked if I’d leave my fashion business behind to work in the food industry full time quite a lot. The answer is, I don’t know. Possibly. There was a time where I was losing sight of the work/life balance – I was doing Spice Club events every Saturday due to demand and I was working 6 days a week too. I found myself getting extremely run down and I don’t want to ever feel that I resent anything I do. I spread the events out a little now, so that I can give each part of my career a equal amount of time. Food is such a big thing to me, and occasionally I do have the feeling that doing food stuff full time would be amazing, but for now I’m keeping my options open. I’m very lucky that my family are supportive – obviously working with your parents is different to the norm, but it allows me to be brutally honest with them though which is a huge positive. I’m very grateful for the fact that they’ve given me this opportunity!